One of the easiest and most fruitful marketing tactics for small businesses is to connect with an engaged email list. While everyone knows that your email list is a revenue generator and one of your most valuable assets, actually creating the list can be quite challenging. You have to know the most effective ways to collect email addresses to grow your list while still respecting your clients’ privacy and maintaining legal compliance. So how exactly do you go about growing your email list? Below are some simple ways to keep your email list and your income growing! Think the phrase content is king only applies to your website and blog posts? Think again! If you are going to be sending out emails to your list, the content better be fantastic. Otherwise, those new subscribers you just received might quickly unsubscribe if the content isn’t worth waiting for. In today’s internet society, people are dealing with the challenge of too many emails. If your content adds no value to them, they are either going to delete it, or unsubscribe completely. Your goal is to keep subscribers engaged so you’re not constantly gaining and then losing subscribers. Your list will never grow that way. You want your readers to welcome your email and maybe even anticipate its arrival, because they know they’ll always learn something they can use. No matter the size of your email list, if you have engaged readers, then encourage them to share your content. There is no better business than word of mouth business and it works the same way with email marketing. A happy customer will be happy to talk about your services or refer your business if they are asked. Be sure to include a call to action within each email. 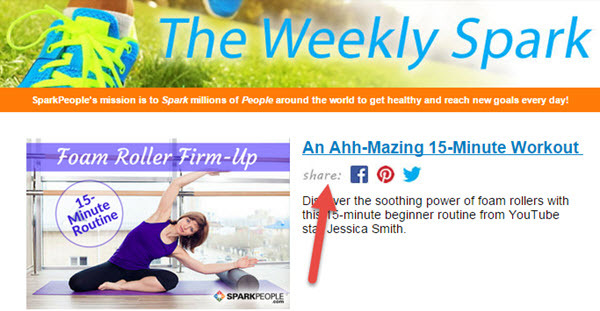 Simply encourage your subscribers to forward to a friend, or put a Subscribe link right in the email. That way, when the email is shared online or with a friend, they can sign up on the fly. Here is an example of how we encourage people to subscribe at the top of the email. We also encourage them to connect with us on social media so that if they don’t subscribe to the newsletter, we can always increase our social media followers. Plus, we always share our newsletters with social media followers anyway, so there is more than one way for them to see the content. Below is an example of encouraging your readers to share each piece of content on social media. When I click the social media button under the title of the article, a box pops up so I can share the content. I can then make a comment about the article, and the photo and link to the article is placed right into my post, encouraging my connections to check it out. This is a great way to let your subscribers drive traffic to your content, and another chance for you to get additional subscribers. 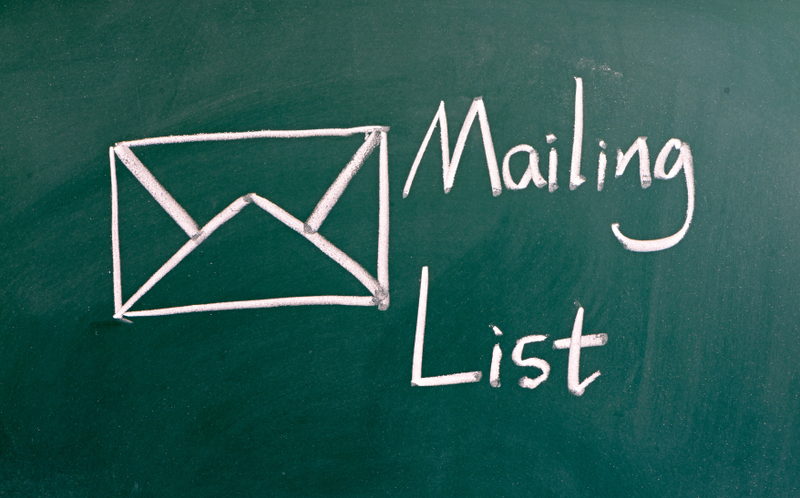 One of the best ways to build your email marketing list is to encourage website visitors to sign up on your website. The website below has information about cancer prevention. Next to the article is the subscription form. They have a good call to action for getting subscribers — “Get the latest on protecting your body from cancer.” If the visitor is reading this article, chances are they’re looking for more content like this so they’re likely to sign up. But it’s getting more difficult to get website visitors to simply sign up for your newsletter. Most are going to need an incentive. 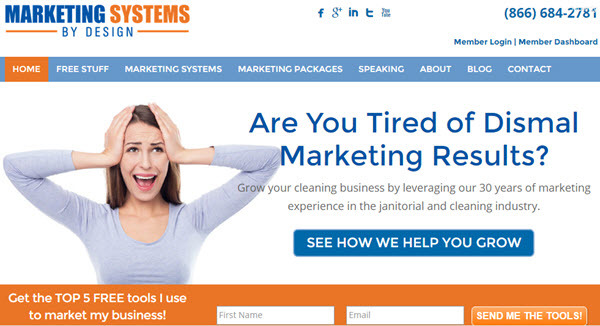 Here is an example on my site, where they can get the 5 free tools I use to market my business. Many sites use a similar incentive, but instead of embedding it on the page, they use a pop-up form like the one you see below. Most people find them annoying, but I can tell you from experience that if the offer is compelling enough, they work! 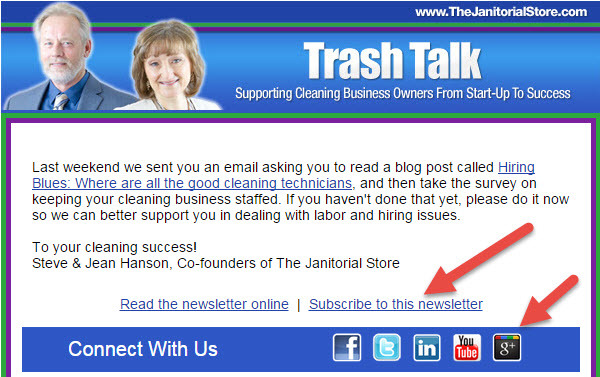 In this example, we not only have a pop-up, we have a call to action on the right side of the page to never miss an episode of CleaningBiz.tv. While it’s no secret that the majority of small business marketing is done through the internet, you can’t forget the old fashion way of pen and paper if you want to be successful. When participating in events like trade shows or conventions, have giveaways in exchange for the email addresses of the people who visit your table, and then input them into your email database. Just be sure they understand what they’re signing up for. While this may be a little more work, the benefits you reap are huge. If you are a speaker, use your feedback sheet to allow people to sign up too. My speaker feedback sheet says: “Email me the link to access the resources for today’s presentation, and sign me up for “Strategic Marketing Tips”. From the first word to the last period, every communication counts. If you want to make life-long clients from your email lists, you better treat them like royalty. The first step you should take is a welcome email to everyone who signs up as a subscriber. This shows that you are acknowledging they are new and you are thanking them for being interested in what you provide. And if you offered an incentive for signing up, this is the place to give them the direct link to the document. If you do have people who eventually unsubscribe, and it will happen no matter how awesome your content is, provide a one-question survey on why they are leaving before they hit the submit button. This tells you if you are sending too many emails, not giving them what they are looking for, or if they simply aren’t interested. It benefits you so you can better understand what your readers want. If too many people are leaving because they are getting too many emails, you can easily dial down your email blasts to encourage people to stay. Stay positive and upbeat and remember to provide valuable content in every email you send and you are sure to grow your email list with ease. And it’s also a great idea to subscribe to companies you respect to gain ideas as to how they are marketing to their potential clients on their lists. By the way, make sure to subscribe to Marketing Systems by Design’s Strategic Marketing Tip to get great tips like this one!